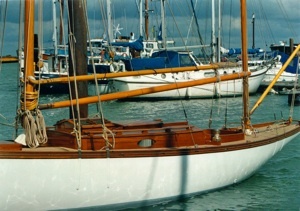 Venture first came into my life in about 1980, when I was invited to sail with her owner Ian Taggart from the Clyde to an Albert Strange Association Meet in Strangford Lough, Northern Ireland. 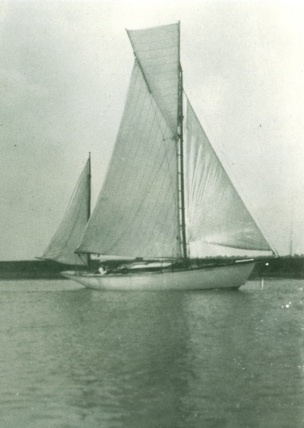 Although at that time she carried her bermudan yawl rig, she showed her wonderful abilities under jib and mizzen in a hard beat to Howth down the Irish Sea, which seemed to match the irrepressible energy of her owner. 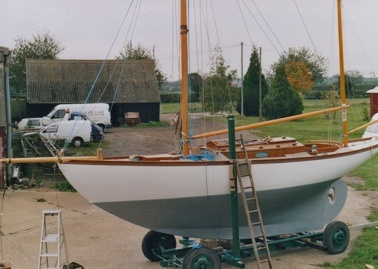 Over 20 years later, she came down south on a lorry for some serious refurbishment. She had had a completely new upper works in the 1960s. 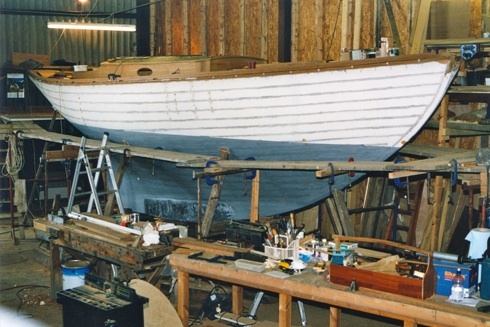 This was now beyond minor repair, and it was decided to return to her original cabin plan. This was never drawn by Albert Strange, but very fortunately existed in one of F B Cooke’s yachting books. 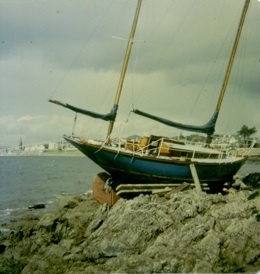 A mishap with a broken mooring in the 1970s. The later cabin and bermudan rig which served Ian and others well for many years can be seen in this photo. 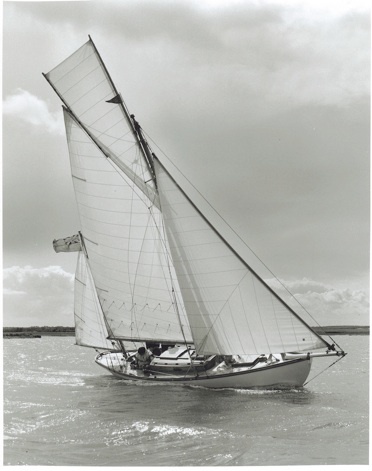 The original rig (left), and the original rig restored (below), with that very effective topsail. 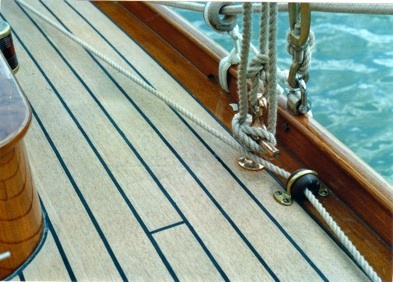 Luff spars for reefing headsails are not new; and if you make them out of wood, rather than a metal extrusion, you can taper them to maintain most effectively the set of the sail when reefed. Jim Byam Shaw made this one, and Classic Marine the handsome bronze furling drum. 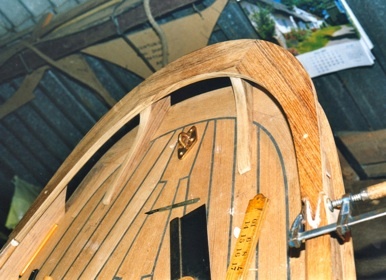 Some way into the restoration, when we removed the ballast keel, we discovered the wood keel was in a bad way. It was replaced, and the work carried on, much the better for this solid new base to work from. About 70 new steamed timber were put in, and iron floors replaced with wooden ones. 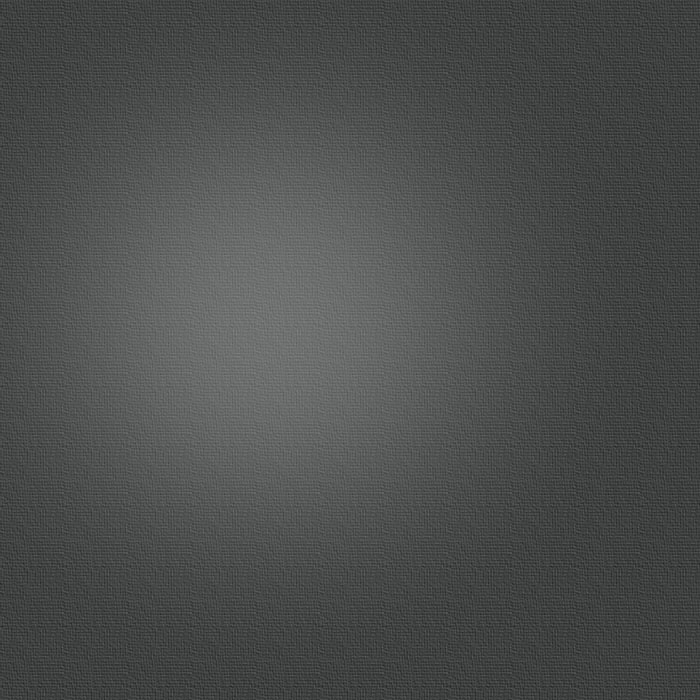 Jim Maynard worked with me throughout this project. 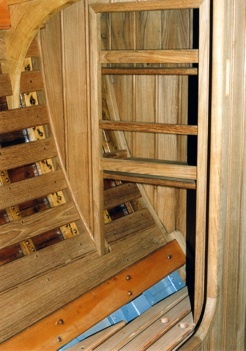 Grown oak hanging and lodging knees, and teak lining. 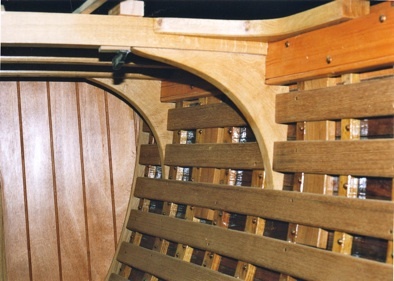 Jim produced fine joinery in the cabin, to the owner’s drawings, while I concentrated on engine installation and cockpit. Caulked and payed. The new teak cabin coamings and coachroof transform the look of the boat. 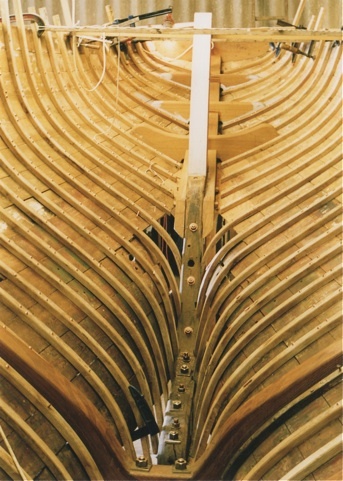 A teak log was purchased in order to obtain boards long and wide enough for the cockpit/cabin coamings. Taffrail under construction. 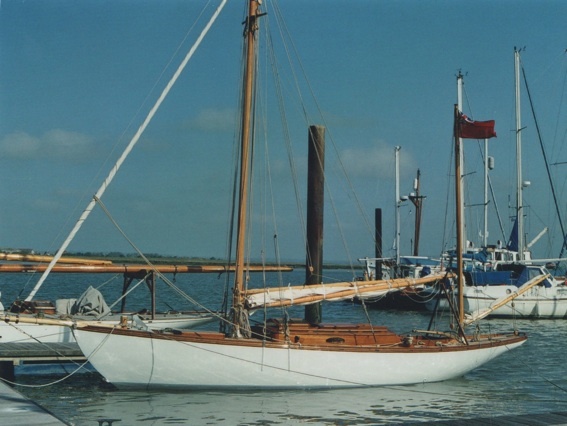 Venture was built about 1/4 mile from where my boat Firefly was built in Lowestoft, and 3 years earlier. In the absence of any other evidence, I felt justified in copying this method of carrying the rail around the counter stern. A view of the deck. 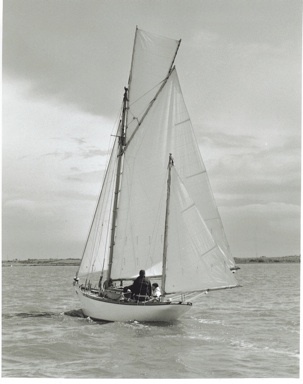 The position of the jib sheet lead was only settled after several test sails. The topping lift is led to a ‘crosshead and eye’. These were cast in bronze by Colin Frake from an old one in my collection of yacht fittings. 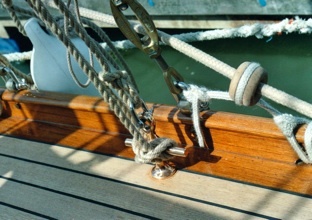 Colin also supplied all the blocks, deck and mast fittings. Lying proudly in her berth after her first sail (and no worthier neighbour than Hardy, fitting out in the background). 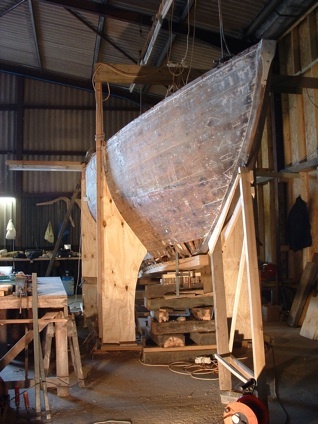 What a joy it would be to see Venture’s sister, Muldonich, similarly brought back to her former glory, lying alongside!